These elements form the bedrock of why a recent collaboration worked so well between Larson Tool and a leading manufacturer that designs and builds gerotors for use as pumping and motor elements. We were contacted by this manufacturer to help in the development and deep draw stamping of parts. Our customer encountered a possible problem after the first production run: there were concerns about the surface roughness of the inner cylinder failing. As we sought answers, the recommendation of a trusted vendor lead us down a path for the solution. He referred us to a metallurgist at a mini mill in North Carolina who was able to provide us with the precise metal configuration that ensures the exact surface roughness that this deep draw stamping part requires. In turn, we can satisfy the production needs of our existing customer and can continue to deliver this part to specification—every time. During production, we were also able to prevent another potential challenge before it became a problem. The customer required electroless nickel plating on the part to help prevent corrosion. We were concerned that the original vendor used to plate the parts would be unable to maintain production quota, which might also effect quality standards. We sought a local vendor, and have since established a good working relationship with this vendor, allowing us to keep up with production on each run. Both vendor collaborations resulted in quality improvement, increased production volume and integrity, and cost savings. 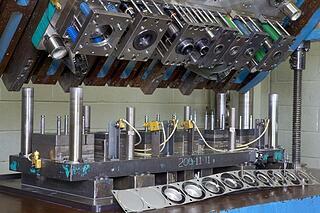 Because of the volume increase with the plating company, we were able to pass along cost savings to our customer. The mini mill forged an arrangement with Larson that allows us to purchase materials on consignment—providing reliable material availability at a reasonable price. There is more to this story, which we discuss in the downloadable case study, “Deep Draw Stamping: Developing Parts for Sustainable Function and Metallurgy Troubleshooting.” Read more about how our collaborative business model helps us to build lasting relationships for long-term solutions.